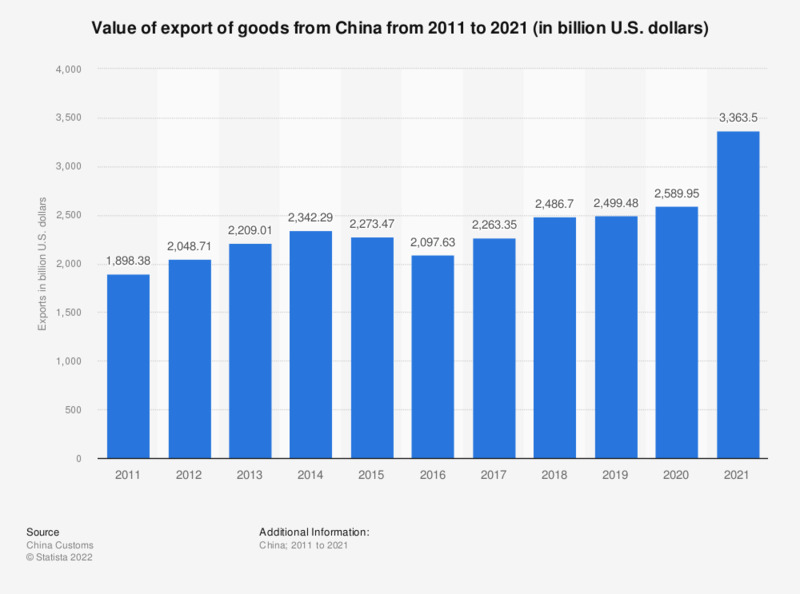 The statistic shows the export of goods from China from 2007 to 2017. In 2017, goods worth approximately 2.26 trillion U.S. dollars had been exported from China. According to the graph at hand, China’s exports have been growing steadily over the past decade, except in 2009 when financial crisis and global economic downturn slowed down global trade. Apart from being the most populous country, China has also become the largest manufacturing economy and the largest exporter in the world. Textile and apparel are among the very first products that had been manufactured and traded in China since the economic reforms started in 1978. Today, China has become the largest textile-producing and –exporting country worldwide. In 2013, the revenue of the Chinese textile industry ranged at roughly 526 billion U.S. dollars. As of 2012, China accounted for approximately 33.4 percent of the global textile exports, followed by the European Union and India with a share of 24.3 percent and 5.3 percent respectively. Textile manufacturing is labor-intensive. With rising labor costs and declining working-age population, China has been less attractive in comparison to other countries including Bangladesh and Cambodia, where the average monthly wage for a garment factory worker is much lower. In order to keep its export advantages, China has tried to move up the global value chain by a shift to high-end exports such as power devices and electronic products over the past years. In 2012, China was the top ranked global integrated circuits and electronic components exporter . The source does not provide an exact publication date. The date given represents the day of data access.